Christine Pullen, the Museum Curator, holding the Award certificate. The award resulted from the imaginative way in which the Museum tackled the Bicentenary of Waterloo in 2015 with the introduction of a highly-acclaimed exhibition. 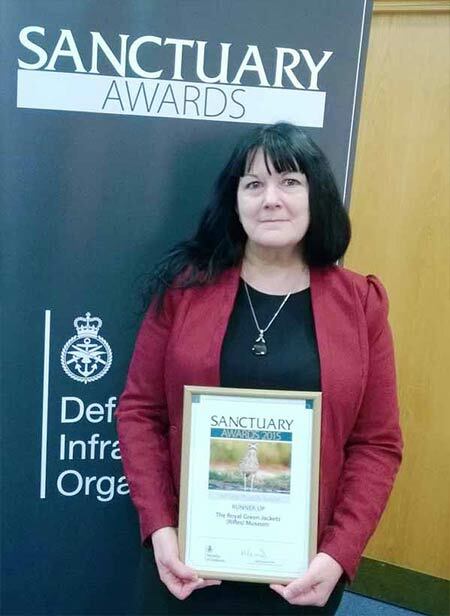 The award also recognised the excellence of the conservation of its famed Waterloo diorama, its associated events programme during 2015, and its efforts to engage schools and the community in Waterloo-related activities. The judges, too, noted the uplift in visitor numbers of over 40% as an indication of the public’s appreciation of the value of the project and the manner in which it has been delivered. If you have not yet visited the award-winning ‘With the Rifles to Waterloo’ exhibition, you really should.